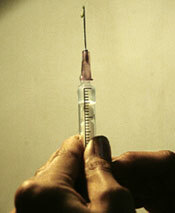 Universal vaccination became part of government policy in 1978. A quarter of a century since, progress has been fitful. In some parts of the country -- the south especially -- progress has been impressive, but in two of the most populous states -- Bihar and Uttar Pradesh -- very little headway has been made. As of now, just about half the children in the country are vaccinated against the six most common diseases -- diphtheria, measles, whooping cough, polio, tetanus and tuberculosis -- that are included in the government's universal immunisation programme (uip). Currently, the annual budget for the programme is Rs 2,221 crore approximately. Global agencies are supposed to help developing countries meet their targets as well as the un's millennium development goal, which is to reduce under-five mortality by two-thirds by 2015. This target will be deemed to have been met if two-thirds of children under one are vaccinated against measles by that date. But on the ground, the role of global agencies is actually making the task of meeting targets even more difficult, by insidiously changing programme priorities in the developing world. Hepatitis b is a case in point. The Global Alliance for Vaccines and Immunisation (gavi) nudged India towards including the disease in the uip. It funded a pilot project after which the Indian government included hepatitis b in the universal programme. The unfortunate part of the story is that gavi just funded the pilot project and the government is now saddled with an expensive vaccine in its programme. This is changing the design of the country's vaccination programme. Traditionally, India, and other developing countries, have spent more on their delivery systems than vaccines themselves, because that is needed for deeper penetration levels. This has been possible because vaccines for the six uip diseases are cheap. But as expensive vaccines are coming into play, more money is being spent on vaccines and the delivery system could suffer. Vibha varshney reports on India's vaccination regime, its global context and the new technologies that are emerging from Western laboratories. Agood example of how manouevring space for developing countries is being constrained is the case of the vaccine for measles, mumps and rubella (MMR). A generation ago, in Delhi you could get vaccinated only for measles and the vaccine was cheap. Now, under the routine immunisation programme in Delhi every child has to get the combined vaccine for MMR, which is double the price, at a conservative estimate. Either government shells out or the consumer. This is not an isolated example. Worldwide programmes are being expanded to include combination vaccines or new ones, increasing per capita expenditure on immunisation. GAVI, which consists of governments of developed and developing countries, UN agencies, multilateral bodies and the pharmaceuticals industry (see box: Alliance board), plays an important role in restructuring national programmes. Seventy-two countries, with a per capita income less than us $1,000, are eligible for gavi support. Till now, gavi has delivered underused vaccines, usually expensive vaccines for which supply far outstrips demand, to 27 countries and transferred funds to support immunisation in 24. But its expenditure statistics show clearly the direction in which it is pushing. 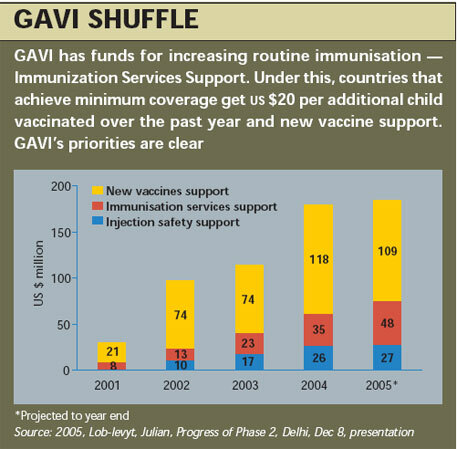 The projected figures for 2005 show that gavi spent us $109 million on new vaccines and us $27 million on auto-disable syringes, while it spent only us $48 million -- roughly 26 per cent -- on support for immunisation services. In sharp contrast, India spent 48 per cent of its budget on training and 14 per cent on service delivery (see table Gavi shuffle; and chart Vaccination cake). The implication is clear gavi is not spending much on helping developing countries increase levels of vaccination penetration, though it is spending on acquiring vaccines. One of gavi's criteria for support shows what its priorities are. It makes just 50 per cent coverage of diphtheria, tetanus and pertussis (dtp) -- the third dose of the old dtp vaccine -- a prerequisite for extending support for new vaccines . With expensive, new vaccines making their way into national immunisation programmes spending on vaccines is bound to increase. Consider the following. The price for a combined mmr dose can be as high as us $28 in the us , while unicef buys a single dose of the traditional measles vaccine for 10 cents. Again, the traditional vaccine against dtp used in the developing world costs unicef just 7 cents per dose, as against new dtp vaccines used in the developed world, which costs us $10.65. Hepatitis B and Haemophilus influenzae type B (Hib) are also cases in point. The hepatitis B vaccine is now part of the immunisation programmes of 153 countries — up from 12 in 1990. In India, the introduction of the vaccine was based on miscalculations. The number of deaths from hepatitis B was exaggerated — up from 5,000 to 250,000 per year. These figures were later successfully contested (see box: Model mayhem). The Hib vaccine is next on GAVI’s agenda. At its Delhi meeting, the Hib initiative was launched to counsel developing countries about the need for the vaccine. So far, 92 countries have introduced the Hib vaccine but it is likely to be the eighth vaccine to be included in the World Health Organization’s (WHO’s) Expanded Programme on Immunization (EPI). This initiative uses the example of its success in The Gambia, where meningitis and severe pneumonia in young children have virtually been eliminated through Hib vaccination. GAVI is pushing the vaccine in India though the evidence to show it does not need to be part of a universal programme is strong. A 2002 study, found just 125 Hib cases among 5,798 cultures — that works out to 2.1 per cent. Not convinced, WHO undertook a study, which found the incidence of Hib at nine per 100,000. WHO hasn’t published the findings yet, though the British journal Expert Review: Pharmacoeconomics and Outcome Resesarch reported that they were presented at a conference. GAVI has now funded another study — to the tune of us $9 million — to be carried out by the Indian Council for Medical Resesarch (ICMR) in Kolkata, Chandigarh and Chennai. Results are expected in six months. This shift has strengthened an insidious shift in vaccine production and availability. 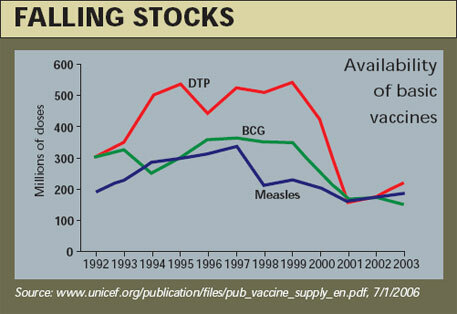 Availability of basic vaccines had improved between 1992 and 1997 with manufacturers from developing countries manufacturing them. But this gain was offset when firms in the developed world started discontinuing such vaccines, especially those used by UNICEF for EPI (see graph: Falling stocks). Given that worldwide vaccines form less than 2 per cent of the pharmaceutical industry, there is no incentive to make basic vaccines when new vaccines fetch better prices. When developed countries began to use the new vaccines, it was a nail in the coffin for their poorer cousins. EPI programmes are, therefore, getting more dependent on a handful of manufacturers from developing countries which still manufacture basic vaccines because dollar payments, leading to tax breaks, still make it profitable. But they too increasingly want to move over to the highend business unless they get further incentives for EPI vaccines, as S S Jadhav, executive director, quality assurance and regulatory affairs, Serum Institute of India Limited (SSI), Pune makes clear. At the macro-level, this trend might have deleterious consequences for universal immunisation. 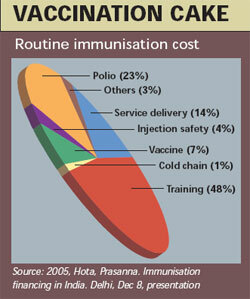 Immunisation is below 30 per cent in several parts of the developing world. 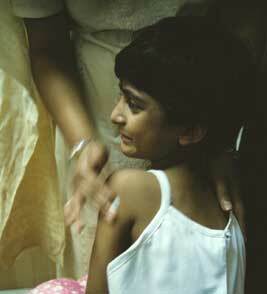 WHO launched EPI in 1974 to ensure that every child gets vaccines against the six common diseases. By 2000, it succeeded in increasing coverage rates from just 5 per cent to 76 per cent. But far more has to be done. A recent study by WHO and UNICEF of in the GAVI-affiliated countries showed that 10 million additional lives could be saved per year by investing an annual average of US $1 billion on child and maternal immunisation between 2006 and 20015. The price tag for universal immunisation in the same period is US $35 billion, of which there is a US $10-15 billion shortfall. But even increased funding may not be able to keep up with the shifting terrains of the markets unless policy changes, as we have seen. Take GAVI. It is estimated that one-third of its annual $35-billion budget for immmunisation will be spent on vaccines alone. But the annual spending on vaccines will rise from about $350 million in 2005 to nearly $1.5 billion in 2015, if programmes include underused and new vaccines. This is the crux of the problem. Research on some diseases is taking off in a big way. These diseases have been out of the ambit of routine immunisation programmes, because they have traditionally been concentrated in developing countries. Now that they are increasingly being transmitted to the developed world because of increased and easier contact, research is concentrating on them. But new research is tinkering with existing vaccines rather than focussing on radical, cutting-edge solutions. One significant feature of the research scenario is that the majority of the funding is coming from the Bill and Melinda Gates Foundation. HIV/AIDS More than 40 preventive vaccines for HIV/AIDS are being tested around the world. Aventis, Merck, Chiron and GlaxoSmithKline GSK are some of the companies in the forefront of research. But two phase-III trials carried out in Thailand and the US have not demonstrated any significant level of efficacy. 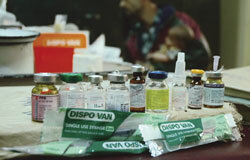 Though VaxGen's AIDSVAX was shown to be ineffective in North America, Europe and Thailand, it was combined with another failed vaccine, Aventis Pasteur's ALVAC-HIV, and further trials were carried out in Thailand in 2004. International AIDS Vaccine Initiative (IAVI) estimates total annual spending on AIDS vaccine research at US $682 million. Current levels of funding, though massive, still fall almost halfway short of the us $1.2 billion that is estimated to be necessary to develop an effective vaccine. The Gates foundation, which is heavily involved in funding the development of a hiv/aids vaccine through the Global hiv Vaccine Enterprise, has set up has made numerous contributions to research on a hiv/aids vaccine. One of the most significant was a us $100 million grant to iavi in 2001. Rotavirus Rotavirus kills about 500,000 children annually. Around 80 per cent of cases occur in the developing world, though the disease, a severe form of diarrhoea, is fairly common even in developed countries. In the us, 50,000 children are hospitalised each year for rotavirus. To protect them, the us Food and Drug Administration (fda) had licensed RotaShield, a rhesus-based recombinant vaccine, in August 1998. The drug was, however, removed from the market when post-marketing surveillance showed there were increasing reports that it caused fatal intestinal damage, after about 1.8 million doses of vaccine had already been sold. New vaccines are being developed through the Rotavirus Vaccine Program (rvp), initiated in 2003 by path, an ngo that is a gavi member. rvp received an initial us $30 million from the Vaccine Fund. It will use this money to promote new vaccines that are being developed. At present there are a total of eight candidates in various stages of development. Rotarix will be marketed by gsk, and is likely to be ready for routine immunisation in Asia and Africa by 2009. Though not against Rotarix, who had informal consultation in February 2005 on quality, safety and efficacy specifications for rotavirus vaccines. Experts then agreed safety data on the vaccine was insufficient. There are suggestions that trials are being carried out in developing countries to test safety standards before the new drugs are marketed in the us. Meningitis project Meningitis a causes major epidemics in sub-Saharan Africa, with a fatality rate of about 10 per cent. In 2001, the Gates foundation gave who and path us $70 million over 10 years for the Meningitis Vaccine Project (mvp), to eliminate the disease, an infection of the fluid around the brain and spinal cord caused by the bacterial group called meningococci. Worldwide, 250 million people are at risk of contracting the disease. In sub-Saharan Africa, a vaccine developed in the West is used as an emergency measure, but it doesn't protect young children. It also gives immunity for only three to five years. A new vaccine is being developed through a collaboration of three groups: the SynCo Bio Partners B V in Amsterdam, sii and the Centre for Biologics Evaluation and Research of the us Food and Drugs Administration (fda), which is providing the technology. fda has transferred the technology to sii, which will manufacture the vaccine . At a target price of us $0.40 per dose, it will cost us $100 million to cover a population of 250 million people over 10 years. This translates into raising about us $10-12 million annually. Malaria Developing a malaria vaccine is difficult because the malaria parasite goes through several stages, even while inside the human host. Protection at each stage requires a different response, which a single vaccine might not be able to provide. As of now, there are 10 vaccine development projects. Two of these are conducting clinical trials in Africa. Nine projects target P falciparum , the most deadly form of malaria, while one focusses on P. vivax , the most widespread form. But a report by Malaria R&D Alliance, an international coalition of malaria research groups, found that annual spending on malaria research totalled us $323 million in 2004 -- less than 0.3 per cent of total health research spending worldwide. Just a part of this is for vaccines. The Malaria Vaccine Initiative (mvi), established under path in 1999 with a us $50 million grant from the Gates foundation which gave an additional us $100 million in 2003, coordinates malaria research. In November 2005, the foundation pledged another us $107.6 million payable over five years. A vaccine developed by gsk Biologicals and mvi has protected a significant percentage of children for at least six months in tests in southern Mozambique. Human papillomavirus Human papillomavirus (hpv) is a sexually transmitted disease and is the major cause of cervical cancer in women, which accounts for the largest number of carcinogenic deaths among women in developing countries. The developing world accounts for 80 per cent of hpv deaths. Phase- iii trials for two new commercial vaccines against this disease are underway. Trials for one, developed by Merck, are being carried out on 20,000 women. The results are awaited. The other vaccine is being tested by gsk -- trials began in 2004. The vaccines are against type 16 and 18 hpv, which account for 70 per cent of cervical cancer cases. The duration of immunity is not known. The new vaccines would have to be given to adolescent girls, unlike traditional vaccines which are given to infants and pregnant women. who received a us $7-million grant from the Gates foundation in June 2005 to promote the development of these vaccines. Pneumonia The bacterium Streptococcus pneumoniae is the most common cause of severe pneumonia and meningitis, worldwide. It is estimated that the bacterium kills 1.6 million people, mostly women and children, annually. In developing countries, one in every 10 deaths of young children is attributed to this infection. Although vaccines for adults and children aged two and over are available, these don't work for infants below two, who are the most vulnerable group. The existing vaccines are effective against some strains of the bacterium, but not against the 12-25 per cent of cases in developing countries. gavi is now funding a project to develop a variant of the existing vaccine for children below the age of two, to the tune of us $30 million. The research project, a public-private partnership, is being conducted by a team called Pneumo adip, which is based in the Bloomberg School of Public Health at Johns Hopkins University, usa. The vaccine industry, which is involved in the project, has already developed some new vaccines that are effective against some of the strains m ost common in developing countries. These vaccines are now being evaluated in large-scale field trials in Africa, Asia and Latin America. In India, as in the rest of the developing world, the new vaccination regime is taking root. But to blame global players alone would be giving the Indian government’s medical establishment to generous an absolution. The whole system is in a mess. Which means, at the end of the day, as far as vaccines go, you can’t be sure whether what you get is really what you need. Reproductive and child health rapid household surveys carried out in 1998-99 and 2001-2002 showed that 72 per cent of districts showed a decrease in immunisation rates — evidenced by a marked increase in the number of districts that had a DTP 3 coverage of less than 30 per cent. This suggest that the delivery system needs to be revamped. A comparison between the pulse polio programme and UIP shows why the situation is so bad. The polio vaccination programme is ‘externally’ funded — meaning donors provide the oral polio drops. But the delivery mechanism is, obviously, the State’s. As the government concentrates more and more on this showpiece programme, UIP takes a backseat. Which means that the success of the polio programme is not being replicated across the board — in 2004-05, US $201 million was spent on the polio programme, while only US $35 million was spent on routine immunisation.“ The way out of this problem is to integrate the polio programme (campaign) into the regular immunisation programme,” says Onkar Mittal, convenor, Swasthya Neeti Samvad, an NGO that works on health policy. mohfw officials say there is no shortage of funds or vaccines. But given the coverage figures, this does not seem to wash. "If despite poor vaccine coverage against six diseases, the government is saying sufficient money is available to introduce new vaccines, it has misplaced priorities," says Sanjay Chaturvedi, professor of community medicine, University College of Medical Sciences, Delhi. If surplus money is available, it can be diverted to provide essential amenities like safe drinking water in slums and villages, he adds. There is also a debate about over-intensive anti-polio vaccination that is not being addressed. Mittal recently analysed the data from the polio programme and concluded that repeated doses of polio vaccine are causing increased paralysis in children. 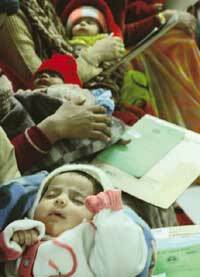 In response to the diminishing coverage of the immunisation programme, mohfw formulated a multiyear plan for 2005-2010. In January 2006, mohfw restated a plan for taking the immunisation programme to the remotest of villages by getting community health centres to deliver vaccines to auxiliary nurse and midwife. As of now, the private sector is supplying most of the vaccines that are keeping uip going. When uip was launched in 1985, the public sector was not up to supplying vaccines in adequate amounts. As a result, in 1986, the Technology Mission, headed by the prime minister, was launched to involve the private sector. The problem is that market shifts make the role of the public sector crucial. 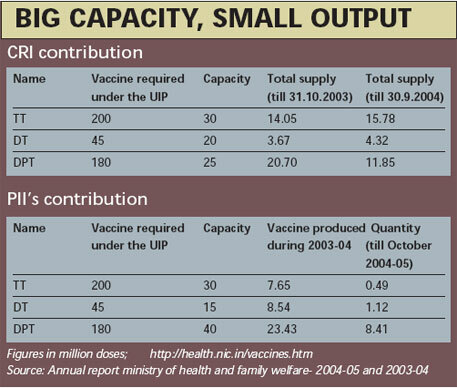 The contribution of public sector vaccine-manufacturing facilities in the country -- primarily the Central Research Institute (cri), Kasauli, and the Pasteur Institute of India (pii), Coonoor -- have played a marginal role in outfitting uip (see table Big capacity, small output). cri produces small amounts vaccine --in terms of targets, capacities and the country's requirements. If abdication is an issue, take typhoid. cri used to make vaccines for the disease, but discontinued. Now, the private sector has taken over the job. iap wants it to be part of uip . C M Agarwal, the mohfw official responsible for cri, says the organisation employs 1,000 people, but is not forthcoming about what they are doing. Repeated requests for permission to visit the cri facility were stonewalled. Neither pii nor cri has contributed much by way of research into innovation suited to India. cri has other crucial functions relating to surveillance and research that it seems to have abdicated. Unfortunately, the government does not put out relevant information in the public domain. cri is also a national regulatory authority, which should be able to perform thorough evaluations of all new vaccines and take informed decisions with regard to authorisation of trials, licensing and performance of vaccine after licensing. But, this work has been reduced only to monitoring whether the vaccine is meeting quality criterion. Specialised functions are going by default -- for instance, tracking salmonella and other diseases for which vaccination is a possibility. Without any regulation, vaccines are being introduced in the country without data. To make things worse, there is little post-marketing surveillance. The technology for developing new vaccines and the research that goes into it is becoming increasingly sophisticated and dependent upon an enormous corpus of funds to get off the blocks. This is raising important issues relating to pricing, access and international equity. Take the flu vaccine -- an important product given the global scare over an impending avian flu epidemic. The old method for producing a flu vaccine involved injecting the virus into chicken eggs from where it could be harvested. This method was cumbersome, long-winded and unlikely to provide sufficient doses of vaccines to fight epidemics. Manufacturers are now trying to use cell cultures to grow the virus. Maintaining the infrastructure for storing and culturing cells is significantly more expensive. In this case, that's a price that has to be paid -- if the epidemic strikes. The technological implications in the case of the dtp vaccine are slightly different. The older vaccine used cultured cells of the pertussis bacteria to make the vaccine. In the new process, the relevant antigen is extracted to make the vaccine. Though debated, the advantage of the latter is that it is safer. The disadvantage is that the process is more complicated and the vaccine produced thrice as expensive. The West has shifted to the acellular vaccine, but India, like most developing countries, still uses the older vaccine. But it can't be assumed that this situation will not change. The case of hepatitis B is somewhat curiouser. It uses a 'renewable' resource -- yeast. The gene from the virus is introduced into the yeast. After that, the yeast continuously produces the antigen from which the vaccine is made. The basic raw material, in other words, is free after a point. You'd think that would make the vaccine cheaper. You would be wrong: defying economic logic, manufacturers are extracting superprofits on the grounds that this vaccine and technology is new. Even technologies of administering vaccines are becoming more sophisticated. In the pipeline are heat-stable vaccines, jet injectors, aerosols and patches. These are crucial for India's delivery systems and indigenous investment into developing them are essential. Vaccines are substances containing a small amount of an inactivated or weakened disease-causing organism such as a virus or bacterium. Even antigens and toxins from microorganisms can be used to make vaccines. Vaccines work by inducing an immune response in people, which then protects them from infection for variable periods of time. In 1798, Edward Jenner, pioneered systematic vaccination using cowpox — a mild illness — against smallpox. The technique was then applied to other diseases by Louis Pasteur who found that weakened forms of microbes too could be used to produce resistance against disease. Most problems that bedevil the government's immunisation programme arise from a lack of regulation and confusion: on the ground and in the policy sphere. The lack of regulation is especially problematic given that the market and the big pharmaceutical companies play a big role in shaping global and national priorities. Chicken pox provides a good example of unregulated marketing practices. In July last year, Ajay Gambhir, honorary secretary of the ima Academy of Medical Specialities, pointed this out in a letter to P K Hota, secretary, m o hfw. He pointed to an advertisement run in the national media by a company manufacturing chicken pox vaccine. The offending advertisement said "protect your adolescent child from marks on the face by taking chicken pox vaccination". "Some of these companies are directly approaching schools ... to promote use of their vaccines, which is highly unethical," was Gambhir's gloss on the advertisement. Presumably, what Gambhir meant, apart from what he explicitly stated, was that vaccination is to protect children from the disease and not pockmarks -- vaccines are not cosmetic products. But more important than what the vaccine-maker said, was what it did not. Experts say that chicken pox contracted in childhood has fairly mild effects, but in adulthood the disease takes a much more severe form. Further, doctors say, it is not known for certain for how long vaccination provides protection. As Gambhir notes, accurate information should be made public. It's not just advertising of this kind, sharp marketing practices of other kinds abound: as in vaccine-makers pushing vaccination programmes in schools. This is not just a matter of marketing but also an abdication of the responsibilities of the state. In connection with the lack of regulatory provisions in the proposed amendment on advertising to the Drugs and Magic Remedies Act, all Ashwini Kumar, drugs controller general, had to say was it did not matter since vaccines were administered by doctors. This cavalier attitude is pervasive. A lack of regulatory engagement is characteristic of the global vaccination regime as well. Take a blatant case. Merck is a representative on the gavi board. Merck is the biggest manufacturer of the Hib vaccine. And gavi is in the forefront of the push-Hib campaign. Not all cases are so blatant but they are damaging nonetheless. There is no place for navet in evaluating the ethics of the vaccine trade -- to expect altruism to be the organising principle is pointless. Only strong regulatory regimes can work -- but, then, even that sounds a bit like something from cloud cuckoo land.